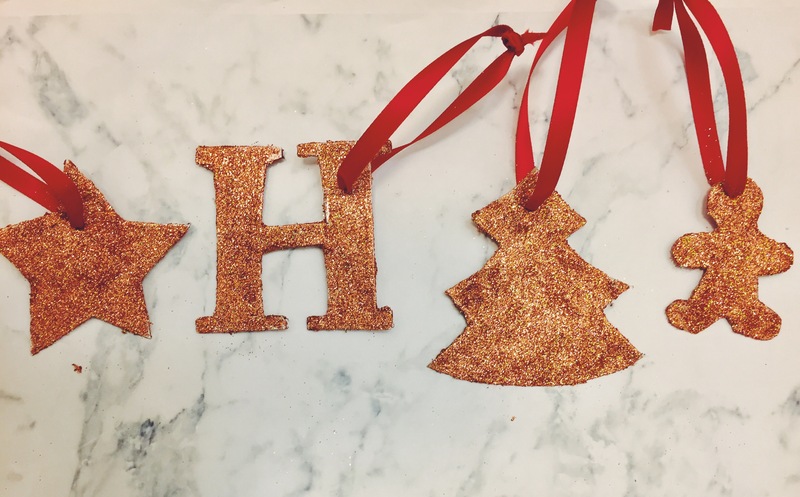 Blogmas Day 3- DIY Christmas Decorations! Inspired by a post from Emily-Alice, these glitter decorations were super easy to make and look so cute on my tree! Pencil (for drawing outlines and making the hole!). Simply cut a shape of your desire out of the card, cover it in glue and then glitter it! If you want to be really inventive, you could even try to make patterns with different colours of glitter. Once they’ve dried (I left mine over night to be sure) make a small hole in your shape and thread a piece of ribbon through. Then use this to tie to your tree! And there you have it, your own glitter decorations! This is a super easy technique, but I absolutely love the outcome! Best of all, this was super cheap to make! I chose a rose-gold glitter for these and simply covered the edges in glue. I then dipped them into a pot of glitter and ta-da! I absolutely adore these and cannot wait to dot them around in blog photos and around my home! I got all of this from Amazon pretty easily and cheaply! That’s it, so a pretty low cost make! Ok this one is really simple, all you do is take the wreath and tie your ribbon around it, for example..
You want the ribbon ends to stick out, but if they’re a little too long, feel free to trim them! And continue this until you have filled the whole wreath! 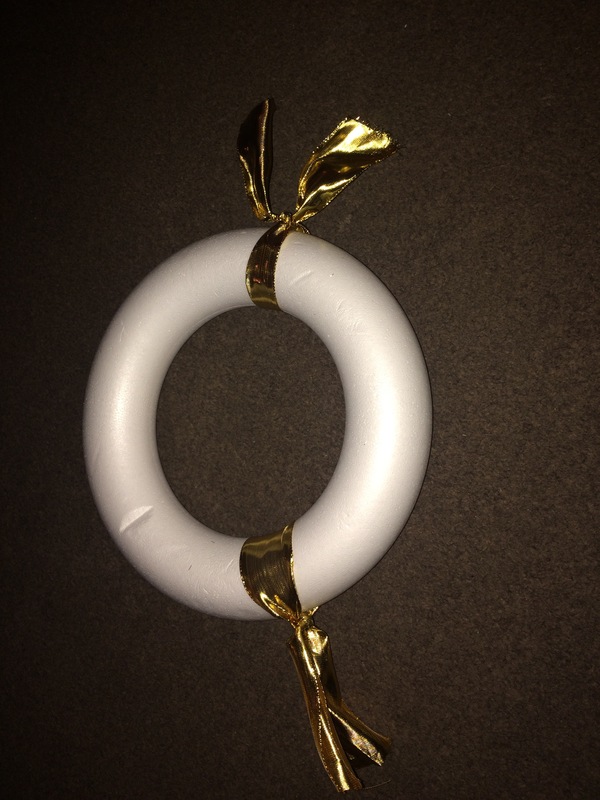 After you’ve filled the wreath full of ribbon, you need to make a hanging loop! For this, take a thinner and longer piece of ribbon and tie it around in the same way as before, except this time you need to tie the loose ends together to make a loop! And there you have it! 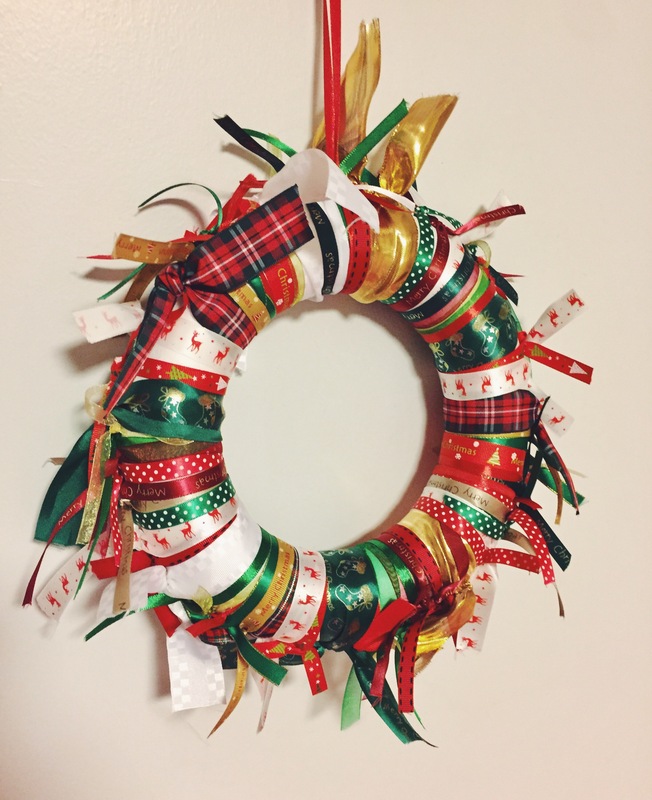 A DIY ribbon wreath! As always, thank you for reading! I hope this post has inspired some Christmas creativity within you! Don’t forget to stick around for the rest of Blogmas. Absolutely love the ribbon wreath, that looks so effective! You’re killing it with Blogmas so far, well done! I’ll definitely be keeping up with your posts! 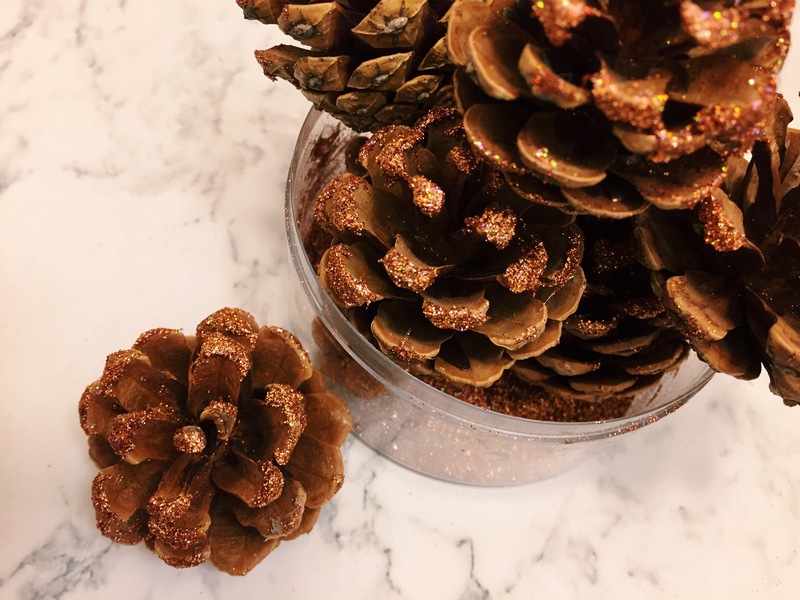 Love the glittee pinecones! So pretty! If only I was crafty…!!! It would be a disaster before I’ve even started!!! These are so cute – I love the pine cones. Some great ideas for crafty Christmas afternoons with my daughter. I’m happy you did too!! Previous Post Blogmas Day 2- Christmas giveaway!